Ah, summer. Farmers markets are hopping, CSAs start up again, and access to über fresh and local produce is finally easy once more. Except that in the first days of summer, the tomatoes, cucumbers, peppers and squash we love to gobble up aren’t ready yet. Instead, vegetables and herbs that may be less familiar — pak choi, fiddleheads, ramps, and garlic scapes — still grace the stands. I’ve learned two tricks over the years when it comes to approaching cooking with new foods and both have served me well. First, ask the vendor. What is this? To what is it similar? How do you like to cook with it? They almost always steer you in the right direction. 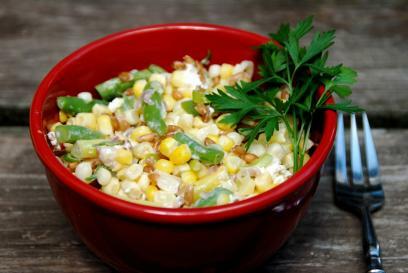 It’s corn time, people! Sweet, sweet corn time. A couple weeks ago when I spotted the Peter’s Pumpkins and Carmen’s Corn stand at the Kingfield Farmers Market, I gasped and shimmied over as quickly as my flip flops would carry me. I snatched up six ears and to my surprise, received a gentle admonition from the owner, Peter Marshall, as he handed it to me: “Now this is good and sweet, but it’s not as good and sweet as it will be in a few weeks.” I’m not sure why I was surprised. I ought to know by now that Mother Nature takes her own sweet time and does things her own sweet way, with little regard for urban corn fiends like me. You know that feeling, when you’ve been with someone a long time and you feel like you know every thing about them. You know every story, every place they lived, every band they loved, but then out of the blue, maybe at a party, maybe while you’re weeding the garden or drinking coffee, you hear a story you’ve never heard before. And in that split second, your eyes open wide and you feel ever so slight a sensation of frisson at the novelty, the mystery, the possibility. Well, I’ve been with vegetables a long time – ever since I can remember, really. At this point, I thought I had tried every one, every which way. I thought I knew all of their seasons, all of their stories. But I was wrong. Oh, was I ever wrong. Last week at the Kingfield Farmers Market, I came upon a basket of bright green tangles that stopped me in my tracks. Here are the contents of this week’s box, along with notes, suggestions, and a picture from Harmony Valley Farm. 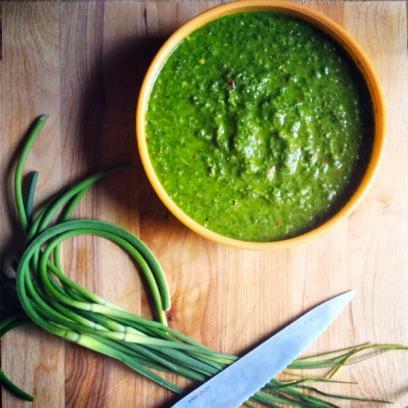 I’m exceedingly happy to be getting sugar snap peas and summer squash this week, and I’m committed to making garlic scape pesto too. Slightly bummed that there’s no fruit share this week, especially since I’ve started squeezing my own orange juice. Oh well, more strawberries! 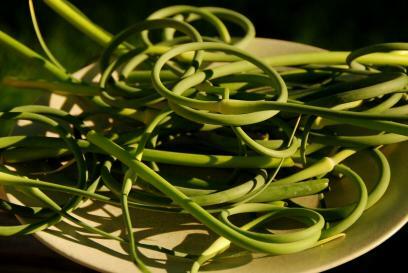 Before last week, I didn’t know what garlic scapes were. I’d never seen them, smelled them, or touched them, and I most certainly did not know where they came from. But our Harmony Valley farm share delivered local, organic scapes to Minneapolis last week - and oh, how far my family has come in one short week. 6/18 UPDATE: I just got an email from Terri Kromenaker at Harmony Valley. She points out that “the fruit share is NOT necessarily local – try as we might, there just aren’t a lot of Midwest organic growers, so much of the fruit comes from the west coast. We’ll get WI cranberries in the late fall, hopefully some WI/MN apples in the fall and maybe some blueberries from MI this summer, but this week’s box is all Cali, I’m afraid.” Thanks for the clarification, Terri. I’m sorry for the error! Has it already been a week? Can you tell from the bigger that the bounty is getting bigger? It's much harder to make our way through an entire box of local, sustainable, organic fresh produce - no matter how wonderful - when we spend part of the week out of town (as we did last week). Lucky for us there's always a line up of family, friends, and neighbors willing to take an extra bag of spinach, green garlic, or bok choy off our hands in a pinch. Why is it so hard to let these treasures go?